Las Boas is the new look of Marina Botafoch and is one the most recognizable buildings of the island, located in the best area of ​ the Marina. 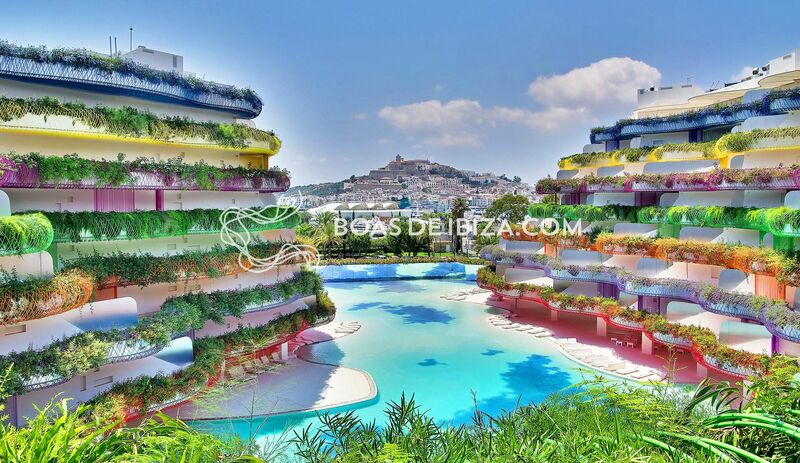 The building was designed by architect Jean Nouvel, and offers the residents a unique Ibiza living experience. The building features panoramic views of Ibiza old town, the port, the island of Formentera and of course seaviews. The luxury apartments are all uniquely designed and individually finished. The building has different color balconies and beautiful gardens surround the scene with a lake-sized swimming pool. Las Boas also features an underground garage, air conditioning, domotics and alarm system. It is a gated community with 24 hour security, a spa, a gym and a private club for residents. The apartment has air conditioning, domotics and alarm system. It is a gated community with 24 hrs. security. Residents hear the "Ibiza rumour network" which up until now has been for residents only, now we will be giving you a taste of the insider rumours and gossip..